Last night I headed out with my family to celebrate my dad and mine’s birthday. His is on the 6th, and mine is on the 8th, so it’s always a joint celebration. I’d love to say the night was all smiles, but sometimes birthdays don’t end up the way you want them to and perhaps I expect too much out of them anyway! But on to the outfit! 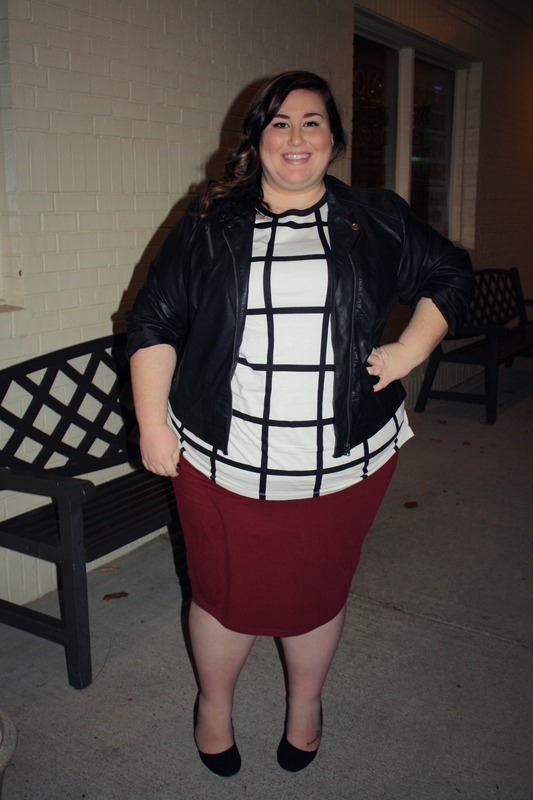 I put to use two of my new items featured on my previous post: ASOS Curve Check Top and their oxblood jersey skirt. I swear these skirts are the most comfortable thing ever. The check top is great (even though its a little askew in the picture), but I’m not a fan of the step hem. I think because it fits tightly on me, the step hem doesn’t “lay” like it’s meant to. Also, I’m someone who always has trouble finding shirts that are long enough, and this top is almost too long on me. If you want it to fit loose, buy your normal size. If you want it snug, I’d size down once. You look great! I love the color combo. Happy Birthday!!! I’m sorry things didn’t quite work out the way you had hoped, both w/ people (speaking of which – is that ur brother?) and your OOTD! That said, u look radiant and polished, as always! Yep! That’s my brother. And thank you for the birthday wishes! Great combo! I need to check out ASOS. Happy Birthday, fellow Aquarian! I went out for my birthday as well last night. My bd is the first. I decided instead of wearing some old jeans, I would wear one of my new finds I bought from my favorite consignment store, Worth the Wait in Virginia Beach. It is a black crepy pant suit with full legged pants and the jacket zips all the way up, but the best feature is the zippers in the sleeves! It is a Tesori Woman size 1x. I wore a green soft poly turtle neck I got along with it. It went perfect with the green scarf my friend bought me for my birthday, The green and white stripes went perfect and I put it on right then and there and wore it to dinner. I love your outfit, It looks so cute. I love the colors of red and black together. You always look so good and have a great sense of style and know how to put things together. When your birthday arrives in a few days, you can have a do-over. I hope your birthday will be wonderful. And I think you look wonderful in the pictures. You put together combinations I would never think to put together. And then they look wonderful on you and I am emboldened to try something new, some new combination, myself. Thanks for your wonderful blog. The combination of the checked top and leather jacket is just gorgeous. wow, I love this outfit! you look radiant and so happy!! Happy birthday to you! 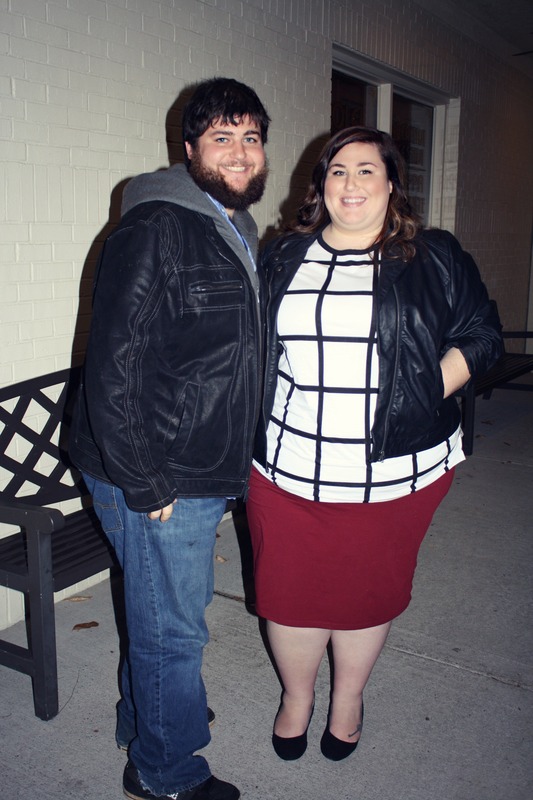 You look amazing, Rebecca! Love this look. I love this lookin you! Happy Birthday!!! You look so cute! ASOS pencil skirts are the best! I like how the jacket adds edge to your look. Happy belated birthday!!! Happy belated birthday Rebecca, you look absolutely lovely! Love it! You look fabulous and I didn’t even notice the lack if accessories until you mentioned it :).